The raft is an inflatable boat which can hold up to 8 people. It is designed for facing rapids in complete safety. The guide is situated at the back of the boat. It is he who directs the boat and who gives instructions to the team. The latter play a key role by following the guides instructions. The aim is to learn to coordinate in order to move forward together, in the same direction as if one single person. This activity is open to children from 7 years of age, allowing families to share an unforgettable moment together. Rafting is an activity which can be adapted to the individual’s desires. It can be done in a laid-back or more competitive, sporting manner. Each team and each descent is unique! The team will travel through the Gorges de Tines along the river, offering the adventurers an exceptional sight! It is the fastest and narrowest passage (2m minimum) surrounded by 24 metres of cliff. All the way along the descent, the vacationers progress with the current, surrounded by nature: extraordinary scenes guaranteed! Jumping into the gorges and bathing are also offered to willing participants, conditions permitted. We offer other routes on request, on the Dranse close to Thonon-Les-Bains with a more challenging route. We offer a free shuttle from Samoëns to Sixt-fer-à-cheval, other shuttles on request. The cano-raft is an inflatable boat, like the raft, but smaller in size; it holds 2 people. Its size enhances contact with the movements of the river, it hugs the form of the waves guaranteeing a descent rich in sensations. With this boat, there is more autonomy: the guide is in a cano-raft beside the vacationers’ one to show them the way. A longer explanation time is required in order to allow everyone to manage the boat both in terms of direction and propulsion. Once the explanations have been understood and a short test run has been carried out, the clients are free to slalom between the obstacles and have fun in the river, a tried and tested method! Sensations guaranteed in the rapids! Departing from Perret (after the Gorges des Tines) up to Samoëns, in other words 5km descent or around 1 hour on the water. This route is ideal for a first experience and to discover the navigation techniques on this boat, all whilst having fun in an exceptional setting. Departing from Sixt-Fer-à-Cheval up to Samoëns, in other words 8km descent, or around 2 hours on the water. This route is directly accessible for those who are regularly active. It can also be offered by the guide to anyone after an initial experience on the discovery route. It allows you to perfect your manipulation of the cano-raft and to discover the Gorges des Tines, the beauty of which we have already mentioned. Jumping in the gorges and bathing are offered to willing participants. By choosing this method, clients will have the chance to put their senses to the test whilst guaranteeing a pleasant and fun descent. We offer a free shuttle from Samoëns to Sixt-fer-à-cheval other shuttles on request. Is the river calling you to take on a solo challenge? You’ve chosen the right activity! The air-boat is a boat which most closely resembles the kayak. As with the cano-raft and the mini-raft, the guide accompanies you but is not with you on the boat. You therefore have to manage the propulsion and direction of the boat alone. To get the activity started, there will be an instruction time allowing you to acquire the basics in navigating white water. You will find out how to hold a paddle, how to use it, what instructions you must respond to on the river, what the route is and also some safety rules. After listening carefully… It’s your turn to play! The first metres on the Giffre will allow the guide to check you have understood the instructions before embarking on the descent. After that, time for you to discover the rapids and surprises that our friend has in store! This route begins at the exit of the Gorges de Tines. It favours the “calm” side of the river for a gentle initiation into solo navigation. This is a good way to put the most timid of participants at ease and allows everyone to have an active experience in complete serenity! You will discover all the different aspects of the river: rapids, bathing and the strength of the current! 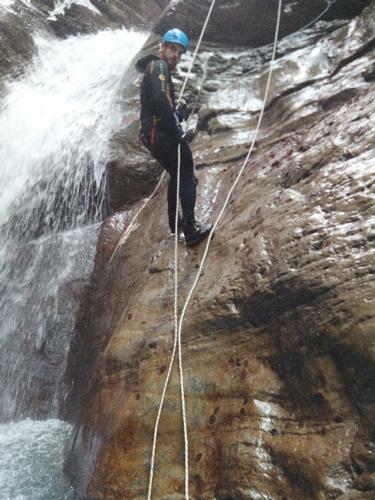 This route is reserved for the most active or those who already have experience in white water (e.g. : discovery route). The departure point allows you to take the boat under hand with some class I and II rapids, before tackling the Gorges and their class III rapids. In order to stay afloat, quick reactions and strength will have to be mustered! Make sure you pay attention to the routes you take, follow the guide! A breath-taking landscape is waiting for you! The little brother of the raft will hold up to 4 people. The guide will participate in the same way as for the cano-raft: in a boat at the side allowing him to guide the way. He will also be present in order to help manage the boat. As for the cano-raft, the route and propulsion of the boat are left up to the team aboard. Very fun activity encouraging a team dynamic! The route will go from Sixt-Fer-à-Cheval to Samoëns, comprising 8 km of descent for around 2 hours on the water, depending on conditions. Jumping into the Gorges and bathing are offered to willing participants. First part of the river in a raft in order to learn the basics of navigation up until leaving the Gorges de Tines. A change of boat will then be made to the mini-raft until the end of the descent, under the advice of a guide. Whole route travelled independently in mini-rafts, supervised by a guide. Conditions: you must be regularly active and have someone in the boat who has experience in a cano-raft and/or on the sports route in the mini-raft. For this activity, Bastien (who never stops adding strings to his bow… we’ve lost count! ), your canyon guide will help you discover another side to the waters of Samoëns, Sixt-Fer-à-cheval and its surroundings. A maximum 8 people per group. Waterfalls,whitewater, slides and jumps will be on the menu. Equipped with a wetsuit, a helmet, and a harness, this activity will take you half a day. The aim is to descend the course of the river, overcoming the different obstacles which nature offers us. We meet at the departure point at the canyon, on the Balme slope. After getting equipped we will set off for 3 hours of fun and surprises! For this activity we have 3 different options depending on your requirements. This route, ideal for families and beginners, will initiate you into the joys of the canyon! Available for those aged 8 and older who know how to swim, this route does not present any particular difficulties. It allows you to immerse yourself in nature. Exceptional scenes guaranteed! Throughout this activity, Bastien will offer you jumps, waterfall descents and a beautiful ending with a succession of natural slides (over 250m) which you can even redo (and you will realise, you quickly get a taste for them!). Your senses will be delighted: admire your surroundings, feel the rocks under your feet and let yourself be surprised by the touch of the water and stones. Keep an ear out for the charming noise of the water following its course… Smell the forest, and the bubbling river! This route starts with a more vertical part and ends with the initiation route with its famous slides dug into the chalky rocks of Balme. Available to beginners, it is recommended for people who are active and searching for more intense sensations. With this route, you will discover all of the technical aspects of the sport, which will remind you of climbing, caving, hiking and even mountaineering! The first part of the canyon will lead us to a rappel descent of 30m! A bit of adrenaline to set you off, and a gentle arrival in a romantic and inspiring setting. The more fun and gentler aspect of the canyon opens up to you, ending with slides to go down over and over as many times as possible! As this canyon is subject to variations in the volume of water, linked to rain levels, it is a secure site: the waterfalls can be skipped and regular exits can be taken. No more hesitating, we’re waiting for you! A more active and challenging Canyon where the waterfalls (7 rappels), the jumps (4 m max) and the slides come one after the other leaving little time to rest! Nonetheless anyone active, even a beginner, can take it on! Located in Morzine, come and discover basins of blue water in the heart of a green natural landscape. This canyon is one of the unmissable canyons of the Haute-Savoie region. The landscape is magnificent, the obstacles fun and technical and, if you dare try the final rappel of 22m, you will almost certainly make it into a photo of one or two visitors observing the adventurers from the “belvédère” viewpoint! As for the previous routes, we meet at the point of departure. 20 minutes walk to approach the start will get us warmed up before tackling the canyon. As is the case for the Balme, several escape points are possible if necessary.